Partou Zia (1958-2008) was born in Tehran and died aged 49 in Cornwall. 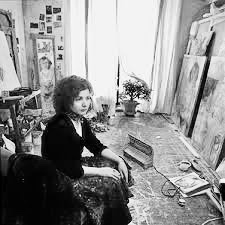 She came to England in 1970, before moving to Newlyn in 1993 with her husband, the painter Richard Cook. She studied at the University of Warwick and the Slade, and in 2001 completed a PhD at Falmouth College of Arts and the University of Plymouth. Exhibitions include Tate St Ives, The Newlyn Gallery, the Exchange, Penzance and Art First. Her work is in the collection of the British Museum, and New Hall Art Collection, Cambridge University. In 2003 Tate St Ives initiated a pioneering residency programme at Porthmeor Studios in St Ives. Partou Zia was the first recipient of this award and her exhibition at Tate St Ives was accompanied by a catalogue ‘Entering the Visionary Zone’. In 2007 she was the first artist to be offered a studio in the newly renovated Trewarveneth Studios. Partou’s canvases bring a fresh note to the long established tradition of story telling. She has been inspired by the writing and illustrations of William Blake, and her work explores a personal journey of self-discovery. Through these vibrant, painterly canvases, she draws the viewer into her dream like memory. Her own language is highly original, evolving a personal mythology of motifs and symbols that include lovers, sleepers, dreamers and readers, set within evocative interiors or luminous landscapes.